General Description: Syrian bean-caper is a succulent perennial, forming a compact multi-branched shrub that may reach three feet tall and spread three feet in diameter. Flower Description: Flowers are single and are on short stalks. Each has five green sepals and five petals that are white to cream with salmon-colored markings. Ten orange stamens extend past the petals. Leaf Description: Leaves are opposite and composed of two leaflets. They are thick, leathery, fleshy and glabrous (smooth and hairless). Stem Description: Stems are branched, either growing along the ground or somewhat upright, and are hairless. Fruit/Seed Description: Seeds are in a 5-celled capsule that is oblong and hangs down on the plant. 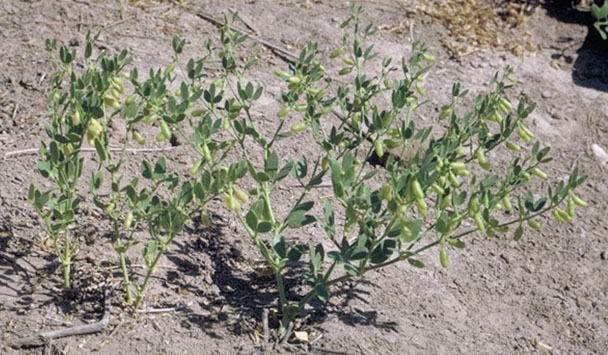 Syrian bean-caper is a threat to agriculture and can form infestations that outcompete native plant species.